Today we are going to look at a cooler that might just fit the bill for your limited search, the Cooler Master Hyper N520. 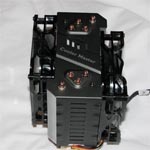 The Cooler Master Hyper N520 is a compact dual 92mm fan CPU cooler that utilizes five heatpipes to dissipate the heat through the cooling fins. Will it impress or will it leave us wanting more? Read on to find out just how well it does.